Kid Sally: Yeah, I'm starting to put things together. Big Jelly: Well, I hope so. I'm tired of going to funerals. A more apt title for The Gang That Couldn't Shoot Straight might be "The Film That Constantly Backfires." There's a lot of talent working on this project�the producing team of Irwin Winkler and Robert Chartoff, screenwriter Waldo Salt, and a fairly impressive cast, which makes the movie all the more disappointing. Viewing it 35 years later, in an age of Analyze This and The Whole Nine Yards renders this comedic take on the Mafia even less funny. Kid Sally (Jerry Orbach) and his friends are low-level hoods working for big boss Baccala (Lionel Stander). Baccala's grip is loosening, as he has to send his wife out to start the car each money for fear of being blown up, and New York's finest fear a pending mob war. Sally sees this as an opportunity to flex his muscles and decides to whack Baccala. Salt's script, from Jimmy Beslin's novel, never really explains the mechanics of Sally's racket adequately. Somehow his efforts involve a circus lion, an Italian bicycle racer, a guy named Mario (Robert De Niro) who poses as a priest, and numerous explosives. The end result is 96 minutes that moves along awkwardly, failing to balance its various ingredients in a way that is remotely entertaining. There are some humorous moments, I concede. I particularly enjoyed a shoot-out where the gangsters are more concerned about their $100 shoes than their own lives. But the jokes mostly fall flat, especially in the subplot concerning Sally's family. Big Mamma (Jo Van Fleet) speaks with a raspy voice that doesn't seem to make any sense for the character. Even more bizarre is Sally's sister Angela (Leigh Taylor-Young), an obviously intelligent college student who wants nothing to do with the mob and still finds herself tangled up in their inane schemes. Director James Goldstone has no wit in his storytelling, speeding along from one scene to the next without bothering to establish characters, and no sense of timing. It isn't enough to simply inform us that these guys are incompetent gangsters and then spend a story showing us that they are incompetent. There should be some inkling of why they can't finish off the old boss, who quite frankly seems as inept as Sally's gang�hey, if I were the big fish and these kids were trying to kill me, I would have them taken care of immediately as opposed to letting them hatch one assassination attempt after another. With the exception of De Niro's spirited performance, the acting is mostly clich�d and uninspired. Orbach is a fine actor, but he has little to work with as Kid Sally. Actually, the most memorable character in the entire movie may be the circus lion stuck in the gang's basement. The Gang That Couldn't Shoot Straight is every bit the dud its title characters are. Image Transfer Review: The 1.85:1 anamorphic widescreen transfer looks about as good as I would expect. There are some minor instances that show the film's age, but otherwise it looks quite good. Depth is well maintained and blacks look fine, with accurate skin tones and decent colors completing the package. It isn't anything special, but it treats the film well. Audio Transfer Review: The mono English track preserves the original theatrical experience. Dialogue is always audible and the musical score comes across nicely. Again, there's nothing noteworthy here, but it makes for a pleasant experience. Extras Review: The only supplemental material for this release is the movie's theatrical trailer. Shown in 1.33:1 full-screen and Dolby Stereo sound, it shows how much better the image transfer is from what the picture used to look like. 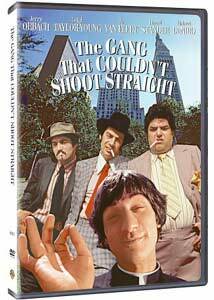 This barebones DVD of The Gang That Couldn't Shoot Straight is clearly uninspired. The image and audio transfers are adequate and the lack of extras makes it easy to pass on this title.